Ahhh. A nice sandy beach, easy access to deep waters, lots of warm sunshine, plenty of food nearby… the perfect home for the harbor seal. Harbor seals are at home all along the Pacific and Atlantic coasts, north of the equator. They are not considered migratory animals and stay pretty much in the same area all year long. Rivers and estuaries are home for harbor seals, as well as sandbars, beaches, and rocky coves. Harbor seals have adapted well to life in the sea. Swimming fairly close to home, they fish locally for food – eating a huge variety of seafood, including fish, squid, crustaceans and mollusks. Dives last 3 to 7 minutes and are usually in shallow waters. But they can dive deeper. Adult harbor seals can dive as deep as 1500 feet and stay underwater over 30 minutes! To do this, they rely on their amazing oxygen storage capabilities. Harbor seals have a grater volume of blood than other land mammals their size. More blood means more oxygen storage. In addition to this, the muscles contain high levels of a protein called myoglobin. Myoglobin holds onto the oxygen molecules until they are needed by the muscles. The heart rate also slows down when diving deep – from 75 to 120 beats per minute to 4 to 6 beats per minute – now that’s oxygen conservation! Harbor seals spend about half of their time in the water, and half on land. They haul out on land to rest, get warm, give birth, nurse and to avoid predators. They also haul out to molt. Harbor seals lose their fur each year, usually at the end of summer after pupping season. During the molting period the seals will haul out for up to 12 hours a day. Their metabolism slows down so they don’t need to eat as much. During the rest of the year, harbor seals usually haul out around 7 hours each day. Don’t get too close! 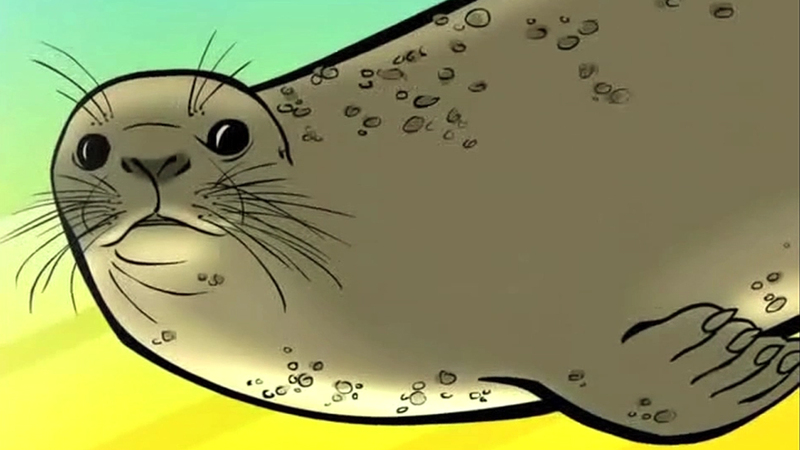 Harbor seals are rather solitary animals. Mothers and pups will hang out together, but otherwise, harbor seals like being alone. They haul out in groups, but they don’t socialize with each other. And they don’t like being touched! When their personal space is invaded they communicate their annoyance by growling, snorting, biting, and flipper waving. Harbor seals do have to deal with predators. Orcas and sharks are their main enemies, but they also have to watch out for polar bears, stellar sea lions, and humans. Thanks to the U.S. Marine Mammal Protection Act, it’s illegal to hunt seals in U.S. waters. With the population estimated around 500,000, harbor seals are not a threatened species. And with proper conservation, they are on their way to becoming a sustainable group.